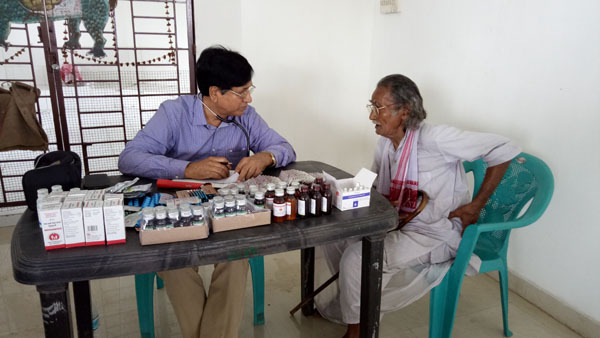 Shiba Foundation, a Guwahati-based socio-cultural non-governmental organization (NGO) organized a health check-up camp. The camp was organized in collaboration with GNRC Hospital at Kailashpur area in Chandmari, Guwahation Saturday. An awareness meeting was also held as a part of the health check-up camp. Manalisha Bhattacharya, wife of Assam Education Minister Siddhartha Bhattacharya, was the chief guest. Dr Uday Bora, Dr Gunabhiram Sarma and Dr Jyotish Sarma were the doctors from GNRC Hospital who attended the camp. Area member of Guwahati Municipal Corporation (GMC) Ward no 12 part B, Dilip Boro, Shiba Foundation general secretary Ashim Hazarika was also present on the occasion. A large number of people from adjacent areas including Amiyanagar, Jaypur and Rudranagar also attended the health camp.